Sarah Newson in action at the Hunts county finals. Having already retained the women’s four-bowl singles crown, Parkway’s Catherine Popple added two more Hunts county titles at Yaxley on Sunday to complete a hat-trick. She teamed up with Sarah Newson to defeat Margaret Elstub and Heather McKillop (Houghton & Wyton) 24-6 and retain the pairs, a title they have won together at national level, and later Sarah’s mother Val and Julie Masters joined them to keep the fours title, 21-13, after an all-Parkway affair against Emma Thurston, Hannah Overton, Michelle Barlow and Pat Reynolds. There was compensation for Thurston, Overton and Reynolds in the triples final, where they defeated Sawtry’s Jan Elliott, Karen Leader and Sandra Minnett 20-1 to retain the championship. The Morton brothers, Tristan and Ean, had their sights on a title hat-trick, but had to be content with the pairs after a 30-13 victory over Warboys duo Tom Swannell and Ed Elmore. The Morton boys, with Mike Robertson and Brian Martin, were beaten 17-21 by Parkway colleagues Stuart Reynolds, James Harford, Simon Law and Stuart Popple, and with Kevin Sandford substitute for Robertson, they went down 4-19 in the triples to Warboys’ Derek Rose, substituting for Harry Ward, Lewis Baker and Nicky Brett. Brett’s daughter Chloe celebrated a title double, beating Warboys clubmate Amy Avory 21-3 in the under 25 singles to win it for the third year running, and Sawtry’s Toby Furzeland by two and a half sets to a half in the under 18 mixed singles. Spare a thought for Warboys’ Ed Elmore who qualified for three finals and finished on the losing side in all of them – pairs, and both singles, 7-16 to Buckden’s James Price in the two-bowl and 9-21 to Warboys’ Simon Leader in the four-bowl which he was defending. Buckden’s Juliet May narrowly lost her two-bowl singles title to Parkway’s Michelle Barlow 15-16, but did retain the secretaries singles after beating Margaret Elstub (Houghton & Wyton) 21-10. Warboys won the Stuart & Co Shield, the inter-club double rink competition, for the fourth time in five years following a 46-32 defeat of Parkway. 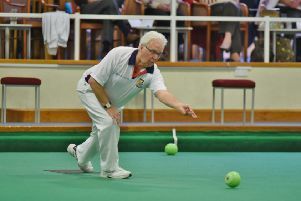 The month-long Bowls England national championships get under way at Leamington this weekend with Hunts hoping they can at least emulate last year’s achievement when the Parkway trio of James Harford, Simon Law and Stuart Popple were worthy winners of the men’s triples. Two of the age-group competitions are first up, with Parkway’s Val Newson and Pat Reynolds in action on Sunday in the over 55 pairs, and Warboys youngsters Chloe Brett and Amy Avory challenging for honours in the under 25 singles. Hunts will be represented in the women’s fours on Tuesday morning by the Parkway rinks of Emma Thurston, Hannah Overton, Michelle Barlow and Pat Reynolds; Sarah Newson, Julie Masters, Val Newson and Catherine Popple. Northants Bowling Federation’s hopes of defending the Adams Trophy inter-county championship at Skegness later this month were dashed at the weekend when Suffolk acquired the necessary points from their rearranged match with North Cambs to top the southern section table. With North Cambs bottom of the table, it was more in hope than expectation that Suffolk would fall short of the 17 points they needed. As it turned out, Suffolk made no mistake, taking the maximum 22 points to finish five points clear of Northants, with Lincolnshire a further four points adrift. The fact that Northants inflicted Suffolk’s only defeat of the season and on their home patch only adds to the frustration as they reflect on a costly six-shot home reverse at the hands of Lincolnshire which proved to be the main reason they won’t be at the seaside defending the title they won last year for the first time in their history. The final of the Northants Bowling Federation’s Adams Cup takes place at the City of Peterborough club tonight with the host club’s C team taking on Parkway. In the semi-finals, Parkway defeated Peterborough & District 64-41, while City of Peterborough C were 56-52 winners against W. Ward B.